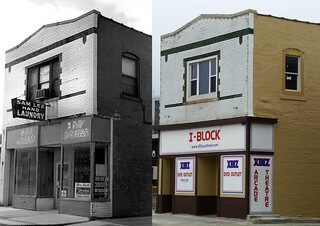 When galechicago posted the photo on the left I thought this old laundry had been demolished at some point. Plus she thought it was over by the old train station. Lo and behold it's actually on Neil Street. The Then Photo is from 1975. Galechicago graciously allowed me to use her photograph for a Then and Now comparison.